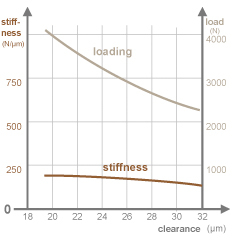 stiffness can be adjusted by varying the pre-loading in holding-strip solutions. 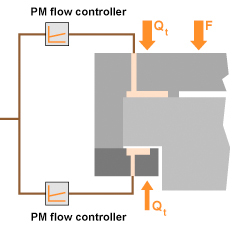 In many cases, holding strips are not needed if the load directions permit this – with PM flow controllers, there is often no need for holding strips for simply increasing the stiffness. 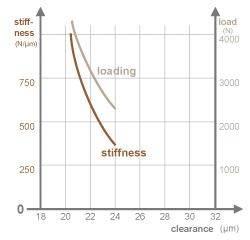 In the case of guides with no holding strips, the stiffness can also be increased significantly by means of negative pressure pockets. 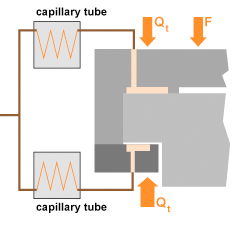 On guides with holding strips, the stiffness of the guide can be adjusted largely independent of the load by varying the pre-loading. 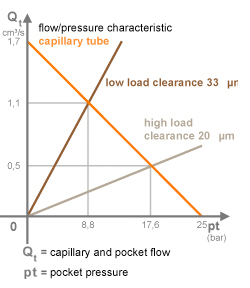 By using our PM flow controllers instead of capillary tubes, the same or better stiffness as ball screws can be achieved, even though the size of the pocket area is restricted. This is why PM flow controllers are a must when it comes to the manufacture of fully-functional hydrostatic lead screws. 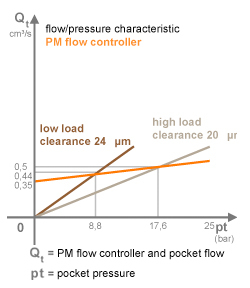 High axial loads are possible because, with PM flow controllers, up to 80% of the pump pressure acts as differential pressure on holding-strip solutions. even fast-spinning spindle bearings can be highly loaded.